One day, this game called Gauntlet arrived at the arcade. For those of you who aren’t familiar with Gauntlet; here’s the breakdown: It’s a medieval fantasy game that takes place in a dungeon. Up to four people can play at a time. There are four different character classes; each with special talents and abilities. So, you and three other players put your quarters into the machine and what ensues is level after level of dungeon travel. This game was relentless! I mean, a real quarter-eater… Things quickly got more difficult with each passing level as the players remained focused on the enemies while at the same time; looked for treasure, food and anything else they could gather up to become more powerful or simply survive! I decided to create four character classes; old school D&D style: Fighter, Magic User, Thief and Cleric. OK, done. From there, I had to define each class. As gamers, we know how important this is. Thus, began the brainstorming… How do these characters remain unique and also mesh as members of a party? Who can do what and why? And as far as Magic Users and Clerics go; they needed spells (more brainstorming, more notes, spell creation and class development). OK, done. Everything in my game was to be based upon die-6. After a lot of scribbling and dice rolling, I came up with a simple character-roll up system (it worked!) and… a no-nonsense combat system (which was crucial to me): I mean; hitting or missing should not feel like a story problem. I sat there staring at this blank sheet of graph paper… “There’s no map”, I thought to myself. “Where do I start? Where am I supposed to go?” In that moment I thought about being my own game master and quickly dismissed the idea. I mean, where’s the fun in that? You can’t GM yourself because there’s no mystery or surprise… I looked over at my 6-siders and I thought about Backgammon… “Luck of the dice.” I said to myself. Then, I thought about Craps, “Luck of the dice,” I said to myself once again. That’s when it clicked. Where I went and what I found needed to be up to a random roll of the dice. I pushed everything back from my desk, took out a piece of binder paper and came up with a table for random dungeon travel. This took awhile… but when I finally got there, I took this concept and ran with it! I made up beast tables, trap tables, treasure tables and more! 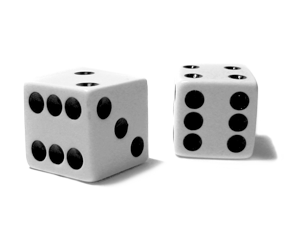 Everything was random; all based upon die-6. And do you know what? It worked! OK, so know I felt that I was REALLY ready to play this time!!! And so I did; level after level… rolling, fighting, gathering here and there, amending my rules and adding more as ideas came to me. Finally, I called it good. Labyrinth was now a solid Dungeon Level RPG (as far as I knew). Labyrinth is something that I have always had with me (whether I was playing it or not). I mean, years would go by and one day I would find my rulebook and think to myself, “Oh yeah, Labyrinth!” And I would roll up some characters and play my game and was happy to discover that my game continued to remain quite enjoyable! I fathomed those words… Labyrinth is Gauntlet on paper and Gauntlet is relentless; you go and go and go and feed your quarters into the machine. “Where’s the reward?” I thought to myself. Well, there is none… you just play and play and… wait a minute; looking back to D&D, there was always a mission involved with a purpose and if you lived through it, there WAS a final reward. As a D&D player, that was my motivation: A victory, a job well done, sighs of relief and shouts of joy! And when I remembered playing Gauntlet… yes, I enjoyed getting more powerful and surviving, but there is truly no end to the game. So, I thought about that for awhile… “Hmmm…” Was there more to Labyrinth than “Gauntlet-like play”? So there you have it! What started out as a simple concept with four different characters that were made to plow through level after level of random dungeon travel had now evolved into a new gaming system within a new world! I had no idea years ago that Labyrinth would evolve into what it is today and I am pleased and proud of the results. 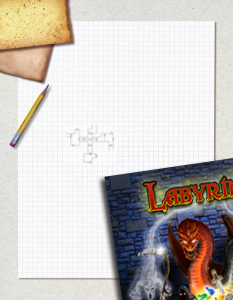 Labyrinth is fun, easy to play and takes you there… to that place where we as gamers love so much.